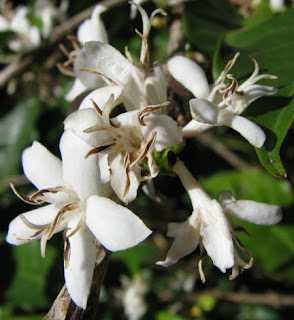 Earlier this week the coffee trees next to our house bloomed. It seemed over night the plants were full of small intensely fragrant white flowers. We enjoyed the scent blowing into the covered porch for about two days before the flowers faded. Bees were plentiful so harvest in December should be good. Costa Rica is not for the squeamish. The other night I was washing my face in the bathroom sink and saw something climb out of the drain. I thought it would be a little bug, but no, it kept coming and coming and coming. The centipede was about 5 inches long. BIG! Many varieties of centipedes in Costa Rica are toxic so we are careful not to touch or get in the way of these critters. Today we attended an Easter party hosted at friends of our neighbors. We enjoyed good food and met new people. Volcanoes Irazu and Barva were in view from the porch of the condo. I have seen these mounds many times but didn't realize they were volcanoes. Probably the most exciting event of the week was monkey sightings. One morning I was sitting on the porch and noticed one about 20 feet from me. I wasn't prepared with the camera and missed an excellent photo opportunity but managed to photograph one in the distance as they went up the hill. This morning as we were hiking up a steep hill for exercise I heard whimpering sounds from above, looked up and saw many, many monkeys. We paused the exercise for about 15 minutes as we watched the troop climb through trees to the other side of the road. A few climbed closer to us to get a view of the "large monkeys" on the street. None thought we were a threat and continued their journey.